My sewing box is a tiny cave of mysteries. 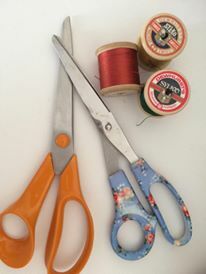 It doesn't just hold my threads and bobbins, scissors and pins; it's got loads of old fabric scraps, odd ends of ribbons and some self-drafted patterns I forgot I had. But I won't be showing you those things today because like most mysteries, we'll leave them unsolved. 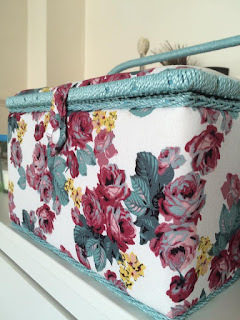 So what's in my sewing box? Firstly, my scissors are like my right-hand woman. I need them for everything. All three pairs of my scissors were gifts from friends and family and they each have their own purpose. The vintage pinking shears are from my Grandma and it's a pleasure to have them in my collection. I've also got perfectly sharp fabric scissors, which you must never use for anything else. 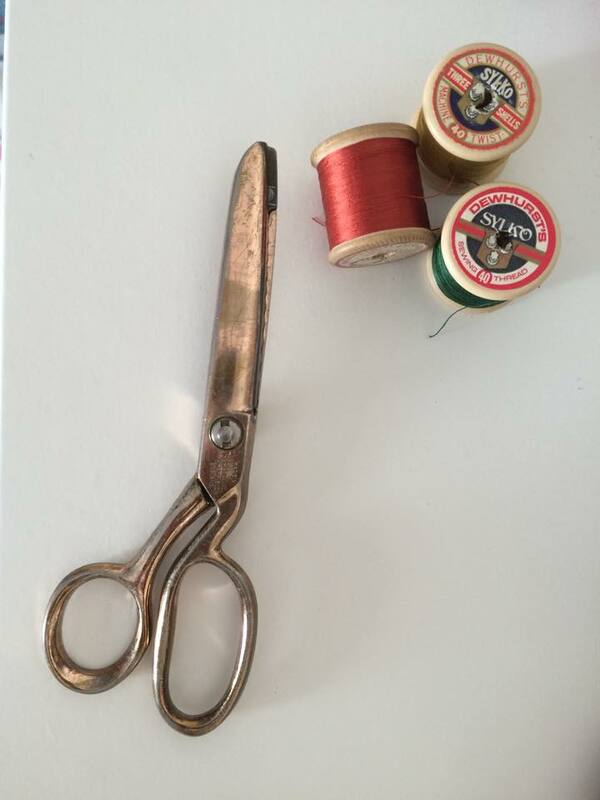 Keep fabric scissors for fabric only and they'll last for years. The floral scissors are my everyday pair for cutting everything else. They're great and they're so pretty! I've recently bought a new pin wheel as after years of sewing, several of my old pins became bent and twisted from the machine. 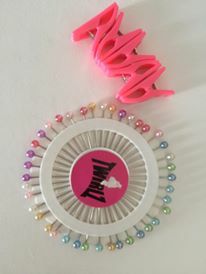 I opted for longer pins with coloured heads and they are great at holding fabric in place, much better than shorter ones. 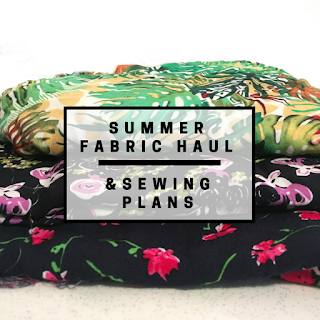 The fabric clips came from Simply Sewing magazine (issue 4) and are so, so handy! 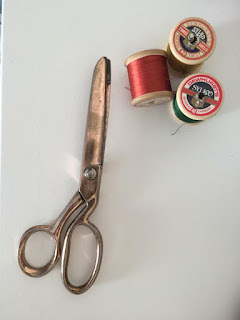 If you've got fabric you can't pin in case you damage it, thicker fabric, or just an awkward shaped garment that pins don't seem to hold, use these clips instead. 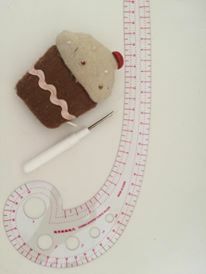 My tape measure was a present from my sister and I love that it's shaped like a cupcake - fitting for my cake addiction as well as my sewing one. The french curve is new and currently unused! 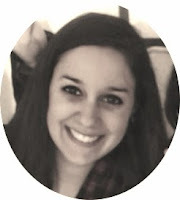 I self draft a lot of my own patterns and often struggle getting a smooth neckline or a rounded armhole to look right. This should certainly come in handy next time I make my own pattern! Finally, the trusted seam ripper. I don't know what I'd do without this. My mum once said, if it's not right, unpick it and sew it again. So with that great piece of advice, comes the very responsible seam ripper. It can take credit for all the garments I've made wrong the first time, but right the second, third, fourth or ... next time round. 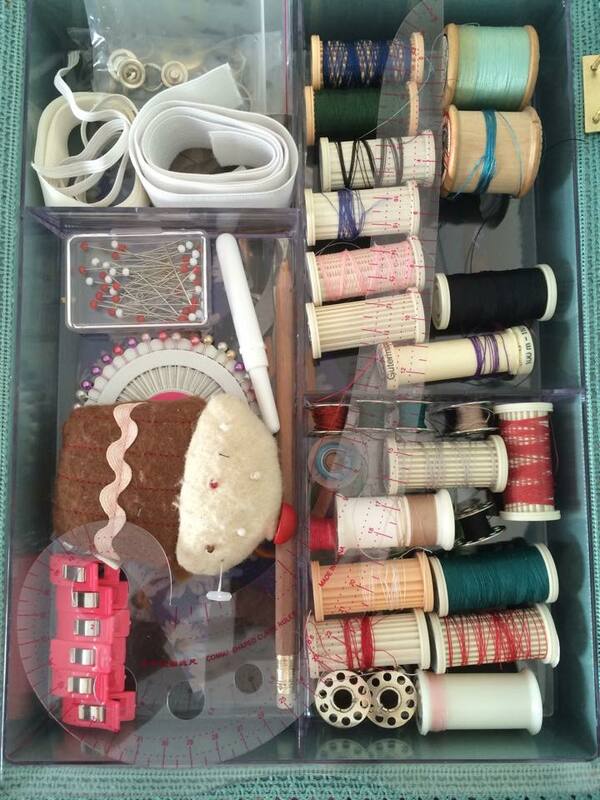 This is the most organised my sewing box has ever been. I love having all my threads and bobbins lined up nicely (until the threads come loose and become tangled) and keeping everything in one place allows me to stay organised when sewing. 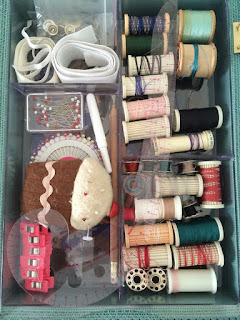 What's in your sewing box? Is there anything you've got that I'm missing? Let me know in the comments! One of my favourite things is a bobbin box. You can get them cheap from Ebay/Amazon/Abakhan. They are great and they hold 25 bobbins. Keeps everything nice and tidy!